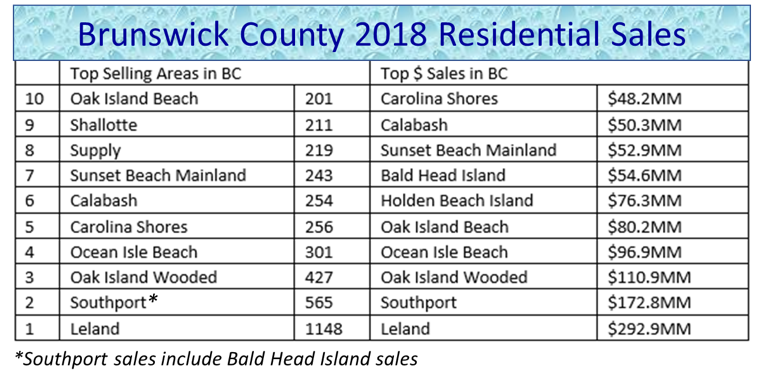 Last year was another strong year for growth in Brunswick County. Leading the way was the continued migration of retirees headed for a laid back, yet, fun and active lifestyle on the shores of southeastern North Carolina. Our area also saw a strong year in beach sales, which means available discretionary funds were more prevalent than in most pervious years. All told, 2018 was a very good year, however, if you were able to remove three factors from 2018, imagine the year that we could have had? The team at Carolina Plantations had its record 12th straight year and increased volume over 2017 by 2.5%, with total sales hovering around $72,500,000. Kudos to Christopher Columbus Creekmore and Seth Barbee for exceeding $20,000,000 each in sales – as that is just an amazing amount of transactions! And congrats to the entire sales and admin team for working so well together and welcoming over 275 new families to Coastal North Carolina! On average, 13 homes sold here every day, or one home every 2 hours! Residential units sold were most since 2005! Interest rates for a 30-Year fixed rate currently range between 4.25 – 4.50%. Developers and builders here are trying their best to provide new land and home options as we quickly are scurrying towards Spring – which is our most active time of the year here. Low rates and increased inventory will propel us to another decisively strong 2019! As we look ahead into 2019, trends we are seeing are less and less of our northern friends are considering Florida as a place to retire. That puts us on just about everybody’s radar plus, a fair percentage of our clients are purchasing or building homes before they retire and/or sell their homes back north. If you are looking to retire or move to Coastal North Carolina in 2019, please allow Carolina Plantations to help you with your process. We hope that you will consider our beautiful coastline as your forever home! Our #1 website will be re-launched in March with a brand new look and numerous enhancements!